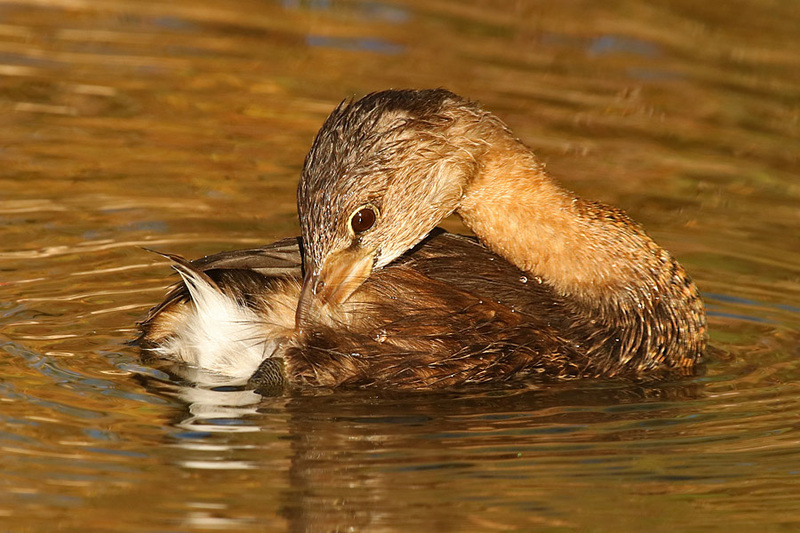 First, the obligatory Pied-billed Grebe, Podilymbus podiceps, this one in basic (= winter) plumage at Papago Park in October. The pair of Pied-billeds at this pond apparently triple-brooded this year, which is amazing to me. I can’t find any references either in my library or online for any more than two annual broods. The season is longer here in Arizona than in more temperate areas, however, and the first brood was out of the nest in late February, when most of the species’ breeding areas are still iced in. 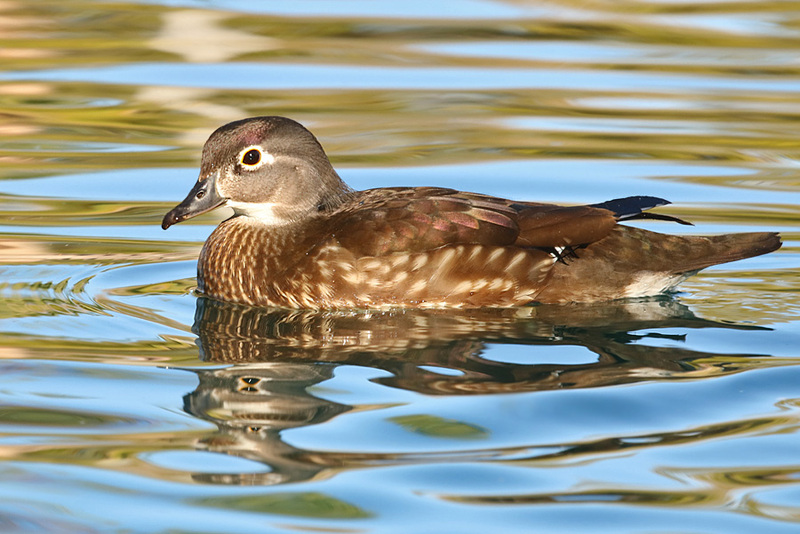 Next, a couple of Wood Ducks, Aix sponsa, from a tiny park pond in Tempe. Surface water’s always at a premium in the desert, and you’d be amazed at the waterfowl that’ll turn up in unlikely places. These were actually found by accident—as I understand things—by photographers who were going to the pond in search of an escaped drake Ringed Teal (Callonetta leucophrys). 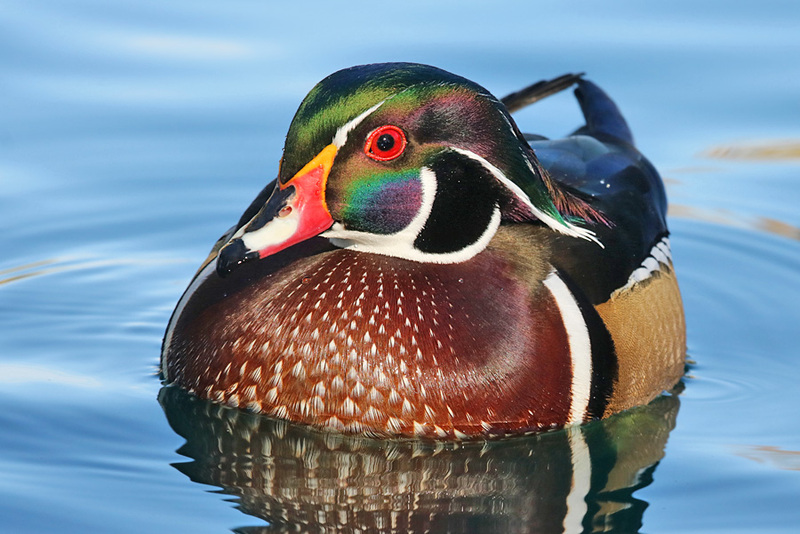 Originally, there were two hens and one drake Wood Ducks, but Liberty Wildlife was rehabbing a drake which was ready for release, and they turned him loose there where he’d have some company of his own species. The drakes are separable by the color of the bare skin around their eyes, the coral red of this one indicating that he’s the one which came in on his own. The rehabbed drake’s eyerings are more yellowish orange. And this is a hen. 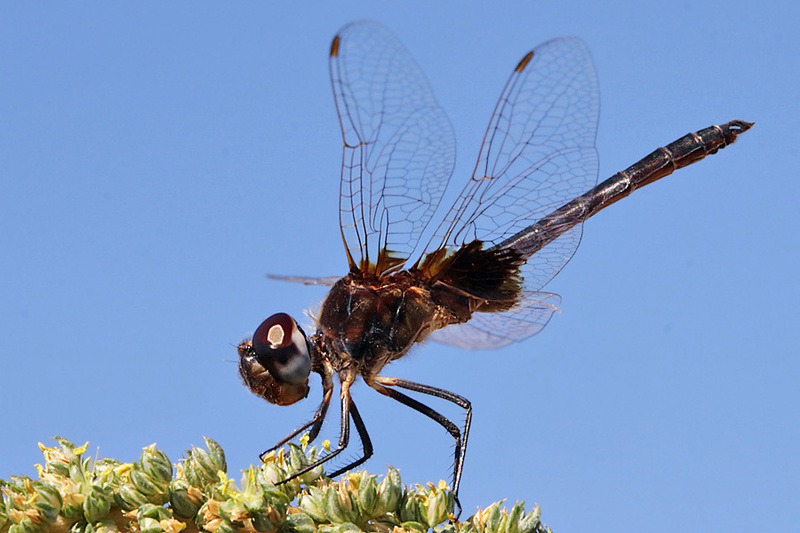 Macrodiplax balteata, known vernacularly as the Marl Pennant. 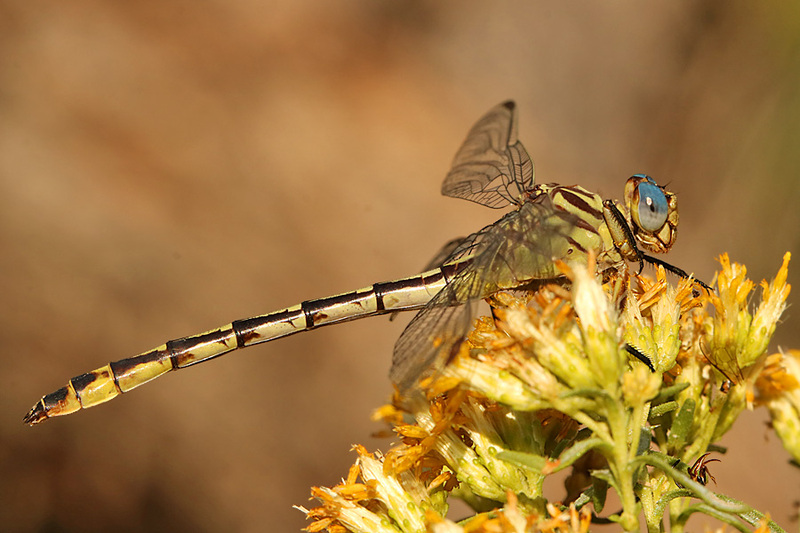 These medium-sized dragonflies are widespread but very scarce in the Phoenix area, and I’ve spent years trying to get some decent shots of them. The problem is that when you do find them they’re invariably perched right at the top of the tallest thing around. Fortunately, a friend of mine who’s also a dragonhunter located a good-sized population of these at a groundwater recharge facility in Glendale that has no trees or tall structures. The buff-colored one is a female, and the blackish-brown job is the mature male. Stylurus plagiatus, the Russet-tipped Clubtail, two images of a female at the Granite Reef day-use area along the Rio Salado north of Mesa. Fall is the season for this species, and I’ve never seen one earlier than about mid-October. This one had discovered an Alkali Goldenbush (Isocoma wrightii) that was being patrolled by a number of honeybees Apis sp (I think), which she was picking off at leisure for her breakfast. She caught and devoured two in the half hour I spent with her. First, a full-body shot to show the features that indicate she’s a female. Her abdominal ‘club’ is only slightly wider than the rest of her abdomen, the abdomen itself is stout, and she’s lacking any sign of secondary genitalia under the second abdominal segment. 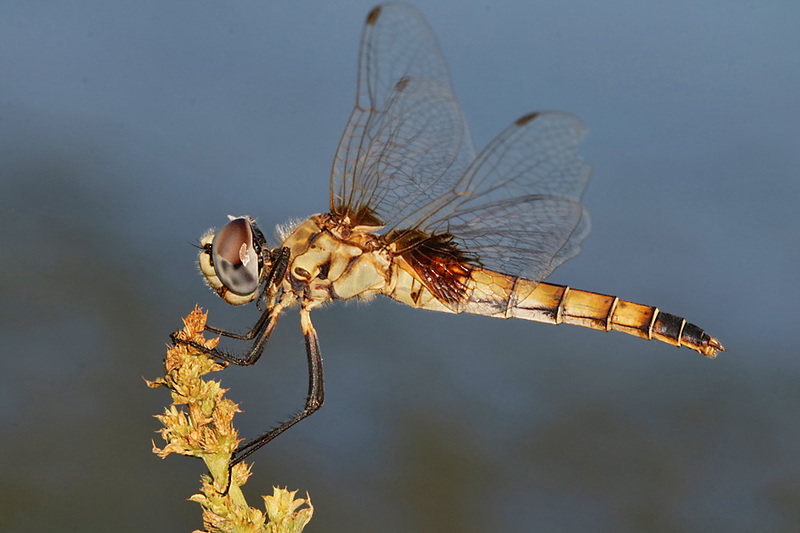 Eastern dragonhunters will also notice that she isn’t anywhere near as extensively russet as they’re used to; the desert form that occurs in Arizona is noticeably different from their eastern form in that regard. And a close-up to show her with breakfast. Female Great Purple Hairstreak, Atlides halesus, at the Granite Reef day-use area along the Rio Salado north of Mesa in early October. Most of the time these guys hang out high in the trees that support the mistletoes that are their larval hostplants, but every year in the early fall they’ll descend to near ground level to feed at the Alkali Goldenbush, and provide photo ops to us lepsters. Ceraunus Blue (Hemiargus ceraunus) at the Granite Reef along the Rio Salado north of Mesa. 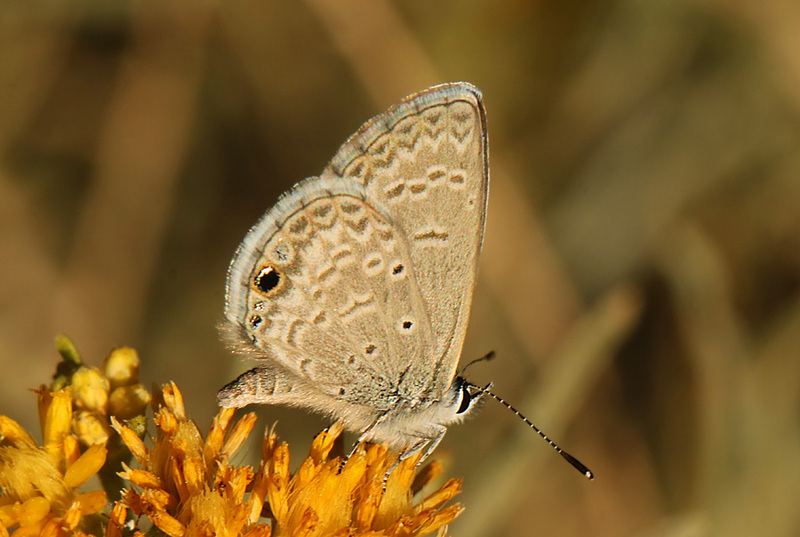 These tiny blues are widespread and common in my area, but I always shoot them whenever possible. There are several species of very small blues hereabouts, and I usually have to get the images up on the computer monitor before I can ID them. 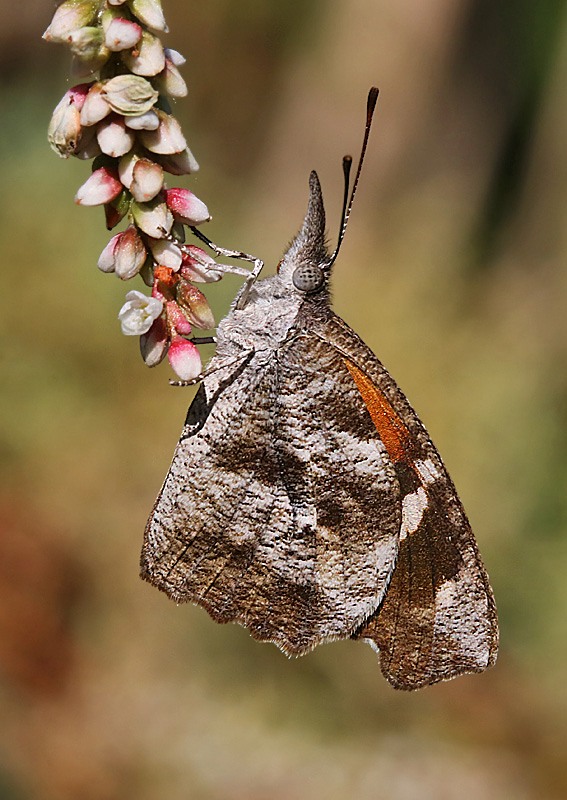 And finally an American Snout, Libytheana carineata, from the confluence of the Rio Verde and Rio Salado a few miles upstream from the Granite Reef. 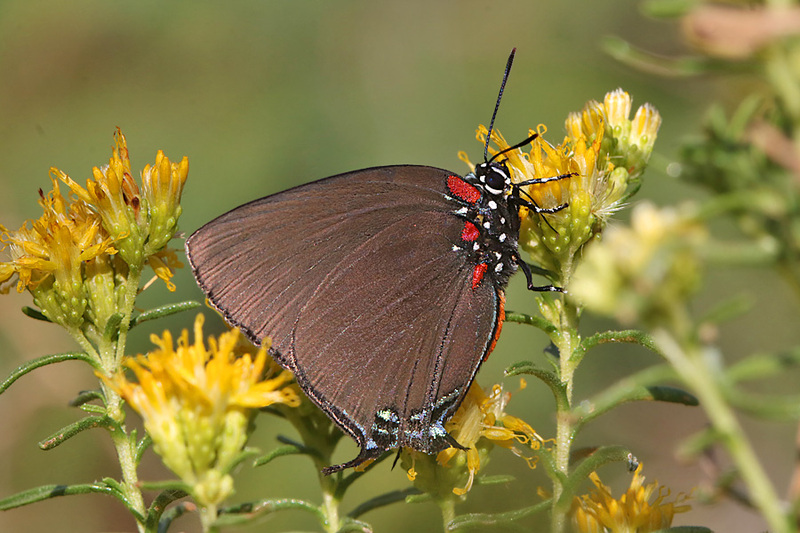 These are late-season butterflies that can be amazingly common here in September. This entry was written by whyevolutionistrue and posted on December 7, 2018 at 8:00 am and filed under birds, insects, photography. Bookmark the permalink. Follow any comments here with the RSS feed for this post. Both comments and trackbacks are currently closed. Most excellent!! All a marvel, although of course I am drawn most strongly to the insects and am especially squishy about dragons. Your pictures are amazing. Great stuff! Love the picture of the snout. Funny how some dragons just like to perch up high. I have the same issues with some of my local species. Even considered going out with a folding stool to address the problem. Lovely assortment of flying critters. Great shots. The lighting is very good on all. As much detail as you’d ever want. And look at the colors! These are wonderful, Pete! 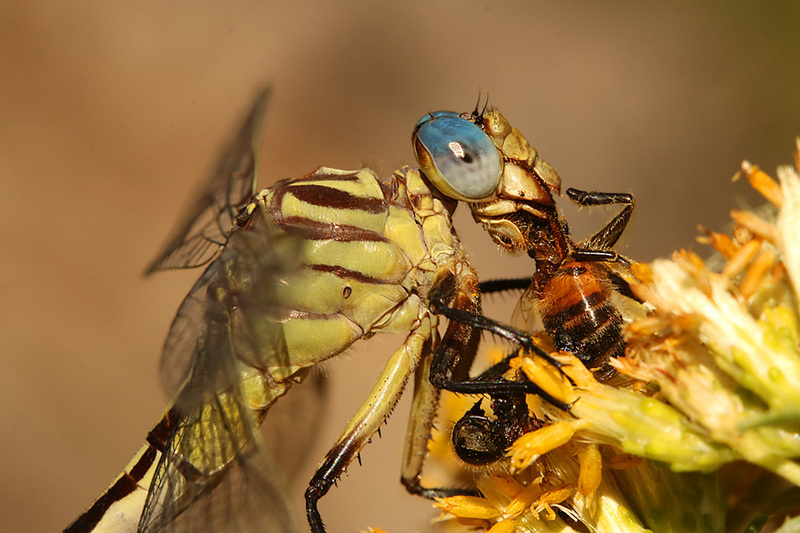 That blue in the dragonfly’s eyes is very striking. Love the wood duck and all the others. Thank you, Smokedpaprika! You should see the eyes of a male Russet-tipped–they’ll knock your socks off! Wow! ! Now I see what you mean! Thank you, everyone, for looking, and for all your nice comments! Looks like he might have been back in Central Park but expected to leave again soon.